Photo is from our Tassie holiday...finding this big sea sponge on the beach at Greens Beach. I hope you are inspired to give the July sketch competition a go! To enter, just upload your layout into the July sketch folder in the Handmade by Suzanne layout gallery by midnight on 31.7.12. As always, it is a random draw, so anyone can win....and it's a $40 store voucher (including free postage) up for grabs!!! Hi, This looks fab Linda, gorgeous colours. You've done a great job giving it a beach feel, Perfect. I am convinced that you love these colors! LOL!!! Your use of them is so balanced and beautiful!!! Love your take on Nadia's sketch!! Yep, agree with Vicky re: colours....mind you, you do all colour amazingly well [& I'm not just saying that - it's TRUE]...I like the bit of corrugated cardboard best...really 'mannish' or something!!! Anyways, I like it!!!!! Oooh, I LOVE your delicious layers!! The white splats on that background are perfect!! that touch of misting in the background is just perfect! Stunning page - the colours really work for this theme and I love the background work!! 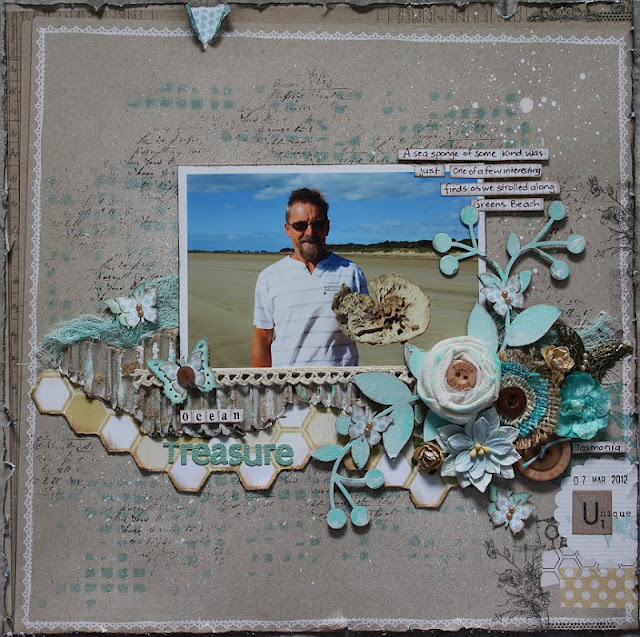 Fabulous beachy page, gorgeous textures and background. This is so pretty. I love the soft colors and all your details. Beautiful work my friend.